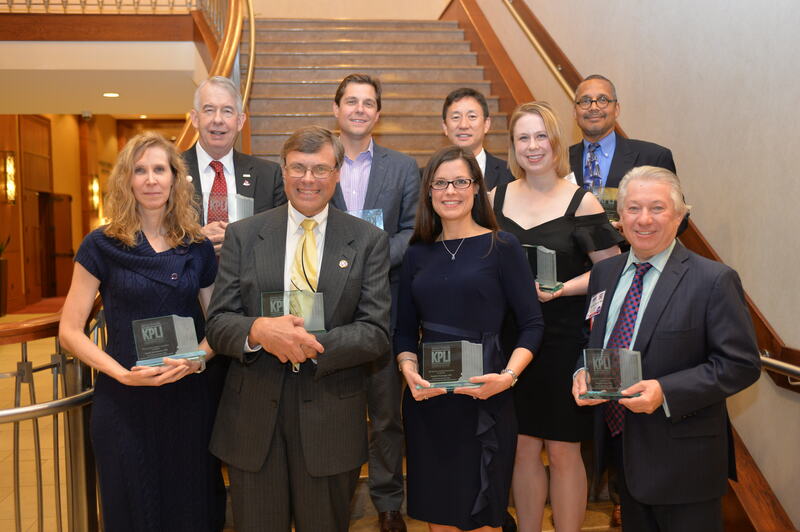 Nine participants of the Kentucky Physicians Leadership Institute (KPLI) were recognized at the 2018 KMA Annual Meeting VIP Board Dinner on August 24, 2018. This is KMA’s second class of KPLI participants, an initiative with the Kentucky Foundation for Medical Care designed to enhance the leadership skills of physicians who can fill emerging leadership roles and influence health care policy in the ever-evolving world of medicine. As part of their training, KPLI participants helped lead discussions at the Leadership in Action event on Aug. 25 on the administrative barriers to the five health conditions that are the focus of KMA’s Administrative Improvements in Medicine (AIM) initiative. The Kentucky Physicians Leadership Institute (KPLI) is the premier leadership training program for physicians in Kentucky. Each year, this exclusive program selects up to 15 physicians to participate in a year-long series of learning events that cultivates the next generation of physician leaders across the state. The four primary events, culminating in the KMA Leadership in Action session at the KMA Annual Meeting, help address many of the challenges facing the physician community. 2018 KPLI graduates include: (from front left): Susan Bushelman, M.D., Florence, Michael Kuduk, M.D., Winchester, Angela Dearinger, M.D., Lexington and Vaughn Payne, M.D., Louisville. Back row from left: Theodore Miller, M.D., PhD, Erlanger, Joseph Hill, M.D., Lexington, Jiapeng Huang, M.D., Louisville, Suzanne McGee, M.D., Louisville and Wayne Tuckson, M.D., Louisville. Photo by David Knapp.